I think you all know by now that I have a personal vendetta against electric yellow store-bought margarita mix. I just don’t believe that we should be drinking artificially colored and flavored corn syrup – you deserve better! I set off to create a frozen marg for you all this month because I already have my wonderful Healthier Margarita on the rocks post which was featured in a great article you should check out about alcohol in the Seattle Times. I’ve also got a Blackberry Margarita served up on the blog as well. But now for those of you who love a frozen drink, I created my newÂ Frozen RumRita Sunset and guess what? It’s got RUM instead of TEQUILA in it. Margaritas that you get in some restaurants or stores can be packed with calories, tons of added sugar and devoid of any nutrients or antioxidants. Everyone deserves to enjoy a beverage without guilt but why settle for something mediocre when you can whip up a simple, delicious version of your own at home? These would be so perfect for a party because they’re full of frozen fruit which is affordable and easy to use. Also, frozen fruit creates a naturally frosty beverage so it will stay cold for a long time and be thicker than if you had just used ice for the “frozen” part. Pacific Coast Producers sent me these incredible Bordeaux Maraschino cherries and I LOVE them. Regular Maraschino’s have some scary ingredients and are full of red food dye but these ones are a beautifully, natural dark color that go so well with the flavors in the fruit in the Frozen RumRita Sunset. Also, I cut one in half and used it to wet the rim of the glass to make the salt stick – perfection! I used rum here because I thought it would match the flavors of the ingredients. But you can use tequila if you want – or vodka. Use whatever you enjoy the most. They are all equal in calories but differ slightly in flavor. 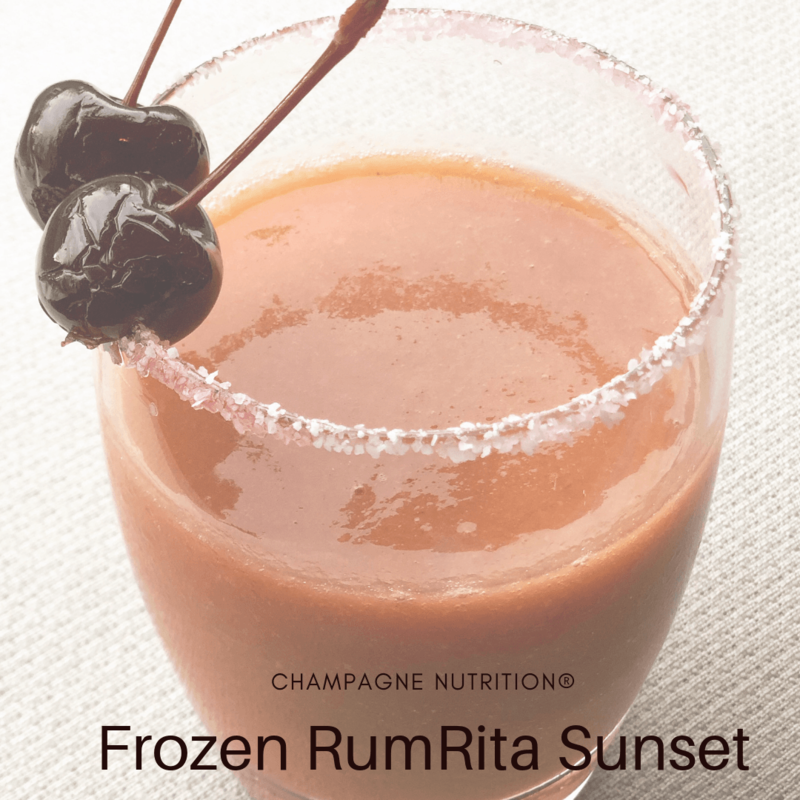 This Frozen RumRita Sunset tastes kind of a like a delicious fruit smoothie but with a bit of a kick so use caution and don’t go too fast with it because it definitely has as much alcohol as a typical margarita. It’s just incredibly slushy and yummy. Let me know if you try it! Combine all ingredients in a blender and blend until smooth and frothy. Run a lime slice along the rim of a large rocks glass then dip the glass in salt (do just 1/2 the rim if desired). Fill glasses with 1-inch of space between liquid and rim. Garnish with Maraschino cherries and enjoy.